We designed our SmartShowing Tours™ to be simple, fast and compatible—ready for mobile devices. The same tour we sell you on this website, is the same tour prospective buyers experience on their mobile devices—not a less-accessible "mobile" version. 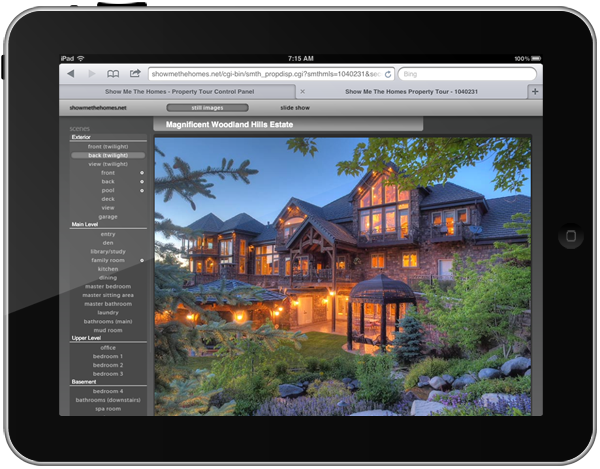 Suppose a prospective buyer notices your listing near another they are being shown. Your listing didn't show up in their search because it wasn't in the price range they or their agent searched, but they're looking now and want to see your listing. With a link to a SmartShowing Tour™ on the flyer or sign, they will get instant access on their smartphone or tablet and you get a great showing. Whether you experience a SmartShowing Tour™ on a personal computer or mobile device, users can click or touch on the right half of the main image to advance to the next image or scene, or on the left half to go back. Every SmartShowing Tour™ includes a fast-loading slide show that follows our visible scene structure like a script. Model home or open house agents like having these run hands-free on their computers or displays. At any point, users can hover over or touch the image to access control to pause, go back, advance to the next at their own pace, or click out of the show to any scene of interest. 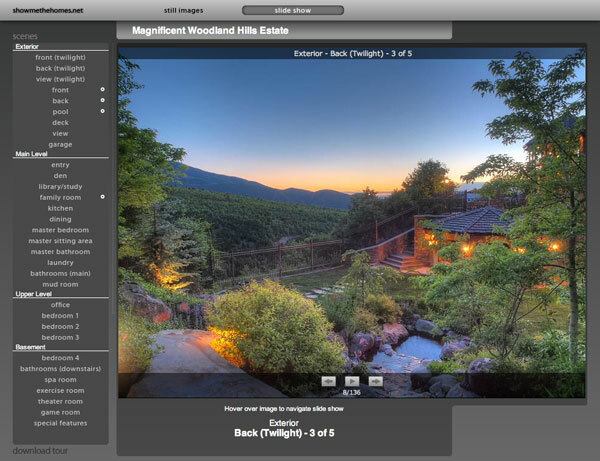 Guided captioning helps users keep images in context of the property. Other so-called "videos" you may have seen are merely still images with effects applied to create the illusion of video. We ask: If the images are still shots, why not hold them still rather than having portions of the images slide or zoom away?